Here's the letter I sent to families Wednesday in advance of the new school year. I want to be sure it finds you one way or another. Your commitment to reviewing the weekly Newsletter helps in countless ways. May you never be too busy to do so. I'll keep writing regularly, as in past years, even as we work hard to get other voices audible via this medium. The summer has felt long, at least to me, with each week offering headlines that left many of us struggling to make sense of events in our nation and our world. Seldom have I been more excited about school starting, in large measure out of a sense that we have so much to do. Our Demonstration School and USN founders and predecessors took their responsibility to society deeply to heart, and they set an example worthy of emulation. 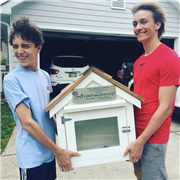 What that means, among other things, is that this fall we should be emphatic about our own community commitments at USN and that we are likely to realize that our own standards may exceed those revealed beyond our classrooms here on Edgehill. In that spirit, let me offer a few examples, and in so doing ask for your active support. This fall, given the political circus of the past few months, projects to be a time of historic incivility. Let us resolve to be apolitical in our educational approach and unceasingly determined to treat others with respect and kindness. Let us be countercultural in that regard. Let us commit to helping to raise the children in our midst to be good to one another, as we, in turn, do the same. Let us understand the challenge posed by growing up in these days of vitriol, of widespread mean-spirited rhetoric and frequent utter disregard for telling the truth or working in unison. Connected to that commitment to civility, let us commit to respecting the identity of everyone in the USN community. Looking at our nondiscrimination statement, it occurs to me that each descriptor in its text has been challenged by words and actions we have heard and seen this summer. What seems to so many of us to be common sense is alarmingly less common in current public discourse. We stand, by contrast, in support and celebration of the dignity and importance of each person at USN, young and not so young. Rooted deeply in our combined commitment to appreciating the diversity of backgrounds present in the life of our school is the opportunity to learn from and understand one another. May we each resolve to listen to the perspectives and experiences of those around us, especially when those stories are unfamiliar to us. Could there be a higher calling or a more powerful opportunity to grow and learn? My pledge is to help create chances for that to happen throughout the school year. So those would be my three wishes as we reconvene. Those will be my own aims, and it strikes me as important to be explicit, given the times. Add, if you would, some willingness to listen as we try to address our city’s transit woes by working our acre here, encouraging carpooling, public transport, bikes, and walking where possible. And please resolve to make the most of this precious year together. Thanks for reading, as always. I’ll try to communicate succinctly via a new Twitter feed that is still making me feel like a geezer. But schools should be places to learn, shouldn’t they? Let’s be patient as routines settle in next week, and let’s be persistent in our promise to set the best kind of example for our children. 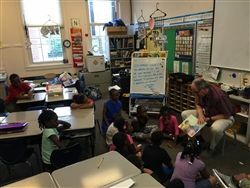 Vince Durnan reads to rising third-grade students in Horizons summer camp in July.